Mercedes-Benz is running press ads flagging up this weekend's special TV ads that will give viewers the chance to determine the storyline via Twitter. Three TV ads will centre on a musician, played by Kane Robinson, and a professional driver who are chased by authorities on their way to a secret gig. At the end of the first two ads viewers will be asked to choose what the characters should do next. They can vote on Twitter with the hashtag #YOUDRIVE. The campaign by Abbott Mead Vickers BBDO, and planned and bought by Maxus, is intended to promote the car marque's new A-Class vehicle to younger consumers. The car marque launched an online teaser on Monday. The press ad is appearing in today's Times, City AM and Metro and will be a cover wrap on the Evening Standard tonight. It is booked into tomorrow's newspapers including the Daily Mail, i, The Independent, the guardian and The Daily Telegraph. The first 60-second spot will air during the first commercial break in 'The X Factor' on Saturday (6 October). The second ad will follow during the next break. The final ad in the sequence will broadcast during Sunday's 'The X Factor'. The 90-second ad will recap the first two episodes before revealing the concluding chapter. Twitter data that reveals the percentage of viewers who voted for each outcome will also be integrated into the final ad. Each spot will direct viewers to a custom-built YouTube channel where they can view the ads and create their own story. The campaign, which also includes cinema, press and outdoor activity, runs until 2 December. Mercedes will also be running a paid-for Twitter campaign to promote the activity. David George, marketing director of Mercedes-Benz UK, said the new A-Class vehicle represents a "new, younger, more dynamic" Mercedes-Benz brand, which is reflected in this campaign. He said: "It's a modern Mercedes-Benz that encourages people to do what we know they enjoy – to get involved. "In doing so, we hope to really cut through, and create a positive, lasting impression on their view of the brand." The campaign was shot in Portugal, by 'Top Boy' director Yann Demange. It has been produced by Stink. The copywriter is Martin Loraine and art direction is by Steve Jones. In April, Channel 4 ran an interactive ad to promote the film 'Prometheus'. The bespoke ad included shots of viewers' responses. 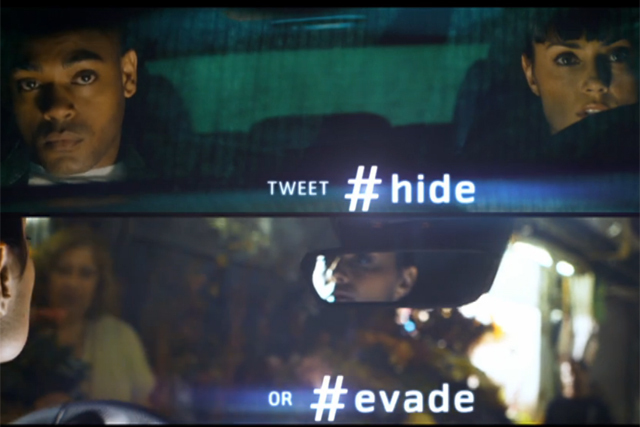 Mercedes’ campaign marks the first time in the UK that an ad's storyline has been driven by Twitter in this way. Industry view: What is the future of interactive TV advertising?